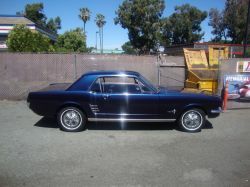 Description: Up for sale is a 66 Ford Mustang. Automatic, Inline 6 motor. Runs like a TOP! Stops and steers well. Needs nothing to be a daily driver. Runs really well. Super clean interior- Instrument Cluster is beautiful, all gauges work. Frt seats are perfect. Back seat has a tear on the top at the seam, aprox 4 inches long at the seam.. Not too bad. Headliner is PERFECT. Looks like it was replaced recently. Stock 66 Mustang Hubcaps.....added a Mustag Spinner kit to the hub caps, but I also have original caps as well. Chrome is in very good shape. Original Spare Tire, with tools and instructions. Trunk is in good shape. New White Wall Tires...Literally 10 days old. Lenses all in good shape, lights are work properly. Also has aftermarket radio mounted under the dash so they didn't hack it at all. Dime sized ding, not dent in rear bumper. Very Very small. Clear Coat on roof isn't perfect, pealing a little. Two paint issues right behind the rear side windows. Right side worse then left. NOT MAJOR AT ALL. From 20 feet away, paint looks REALLY GOOD. Up close it has a couple issues. Dash board itself has a crack. I've only owned the vehicle a short time. It is currently registered and insured, and has a clean title. With a new coat of paint, this thing is show worthy. Really nice, clean 44 year old Mustang. These aren't easy to come by. According to Serial #, Car was built at San Jose factory. Would consider trade for 67-72 Camaro or 64-72 Chevelle. $5000 obo, not in a huge rush to sell. Will post A LOT of Pics tonite.